Grand mal seizures or tonic clonic seizure is a type of seizure disorder that is usually associated with epilepsy. However, grand mal seizures do not only occur in humans. Grand mal seizures can also occur in pets, such as dogs and cats. Many people do not know that such disorder or medical condition can happen to their pets. And by the time the pet owner witnesses his or her pet undergoing a grand mal seizure, he or she do not know what to do and is mostly frightened and shocked all throughout the grand mal seizure episode. What Causes Grand Mal Seizures in Cats? And if it has been found that the grand mal seizures of your cat has no known cause, the seizure disorder of your cat is referred to as primary or idiopathic epilepsy. Pre-Seizure Phase – During this phase, this is when cats feel an aura that an impending grand mal seizure episode is about to happen. 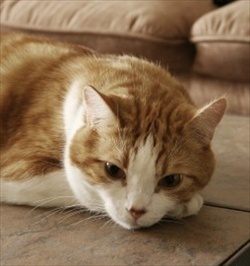 It is during the pre-seizure phase wherein cats will be agitated, restless, and will act very differently. The pre-seizure phase usually occurs just several minutes before the seizure itself takes place. Seizure Phase or the Ictus Phase – It is during this second phase wherein the seizure itself is going to happen. During the seizure phase, the cat may lose consciousness, may possibly collapse, and will experience spasmodic jerking (tonic clonic movement). During the seizure phase the cat may also vomit or even urinate. Post-Seizure Phase or Post-Ictal Phase – this phase is known as the recovery phase. During the post-seizure phase, the cat will most likely be confused, disoriented, and may sometimes be temporarily blind. It is during this phase that the owner should keep the cat company for reassurance.